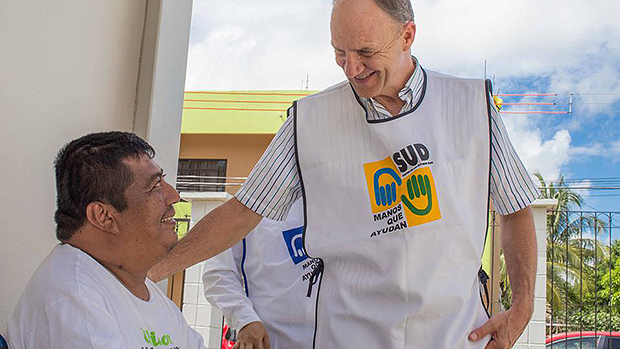 Cover image: On September 14, 2017, Elder Paul B. Pieper, Mexico Area president, visited food distribution points and met with government and local Church leaders, as well as families affected by the September 7 earthquake. A second serious earthquake hit Mexico again on September 19. About 700 Mormon volunteers recently gathered to assist in earthquake relief efforts in the Mexican states of Puebla and Guerrero. Elder Arnulfo Valenzuela of the Mexico Area Presidency of the Church said the Mormon Helping Hands volunteers provided their own transportation to serve. President Valenzuela said there is still much work to do and the Church volunteers will continue to assist in the coming months. Two earthquakes struck Mexico within two weeks, killing hundreds of people and affecting millions more. An 8.2-magnitude quake September 7 mostly affected the states of Oaxaca and Chiapas in southern Mexico. The epicenter of the 7.1-magnitude earthquake September 19 was near the town of Raboso, about 76 miles southeast of Mexico City.